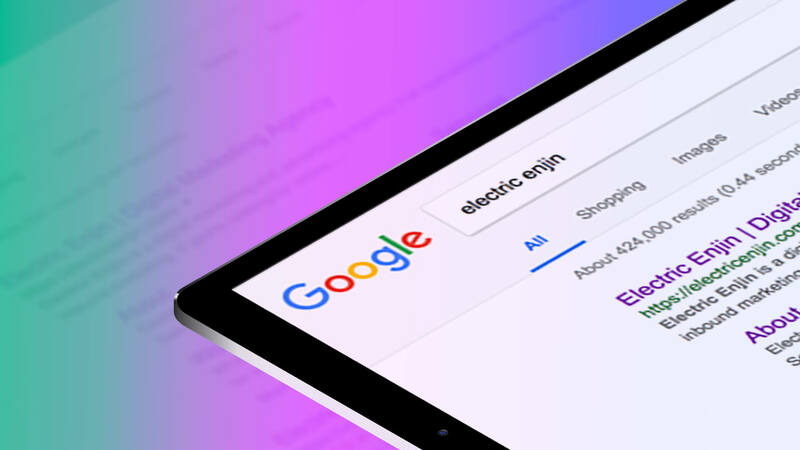 Here at Electric Enjin, we use an SEO checklist to ensure our websites take advantage of every opportunity Google uses to rank domains and pages through organic search. If you're a web developer, designer, copywriter, or agency that's looking to step up your SEO game, here are some tips to ensure your website is up to snuff with SEO best practices. In this article we're going to primarily discuss the coding structure of the site. Meta tags are important because they provide information about the page content within the search and share links. This would be your page title, description, and an image for sharing. There are additional meta tags that provide more information about the page and company itself. From a coding point of view, the meta tags live between the <head> tags. On average, our pages have about fifty meta tags each. Google has its own guidelines that determine what meta tags it specifically searches for. One meta tag you shouldn't worry about is the keywords meta tag. Originally, the keywords tag was used to provide context around your content, but Google no longer evaluates that tag in its algorithm. Alt tags are descriptions of an individual image. They're also read aloud by screen readers for the visually impaired. For SEO purposes, we'll want to include contextual information about each image. We try to hit some of the targeted keywords within alt tags if possible. Headline tags, which are <h1> through <h6>, define the most important heading to the least important, chronologically speaking. Because our <h1> tag is the main headline on the page, it's important to also have your targeted keyword(s) there as well. You'll only want to use one <h1> tag per page, but it's OK to have multiple h2 or h3 tags along the way. Google and other search engines use headline tags to understand what the page topic is. Headline tags are also a great way to give an overview and outline of your content. Headlines should also be short, punchy, and easy to scan. The purpose of canonical (canonicalization) tags is to let search engine's know which URLs represent duplicates of the master URL. Sometimes, URLs may have a slightly different structure while still representing the same page. We may know that it's the same page, but search engines do not. Because duplicate content can negatively affect your search ranking, it's imperative we give some guidance to the search engines. In terms of code placement, the canonical tag lives within the HTML header. Structured data deserves its own article because it's such an extensive topic. However, I still wanted to give an overview of structured data and why your website should capitalize on such great search features. Structured data allows you to markup certain pieces of information including products, reviews, show times, people, articles, organizations, locations, restaurant menus, and local businesses. Those snippets will show up in the search and give the user more insight into the value of that page. I recommend visiting https://www.schema.org to learn more about rich snippets. Google offers its own markup guide as well. Rich snippets appear as text, but rich data cards take it up another notch with visuals. Imagine being able to showcase and distribute your content such as products, job listings, breadcrumbs, books, courses, events, reviews, and company profiles from a search. Check out Google's search gallery for great examples of how to integrate these elements. You can also test to see if Google is picking up those snippets or cards through Google Search Console. Most people already know about Google Analytics and Google AdWords, but Google Search Console is often overlooked as an amazing tool to measure your appearance in a search. Once you verify your domain with Google Search Console, you can start to see how people are searching for your site. Google will provide search analytics that include the keywords, total clicks, impressions, positions, devices, and location. This is a great place to start as you develop your keyword strategy and mapping. On that note, I also recommend creating an AdWords account, even if you don't plan on doing paid search (SEM) or Display Media. AdWords includes a fantastic free tool for keyword planning that allows you to see the search volumes, competition level, and cost per click of specific keywords. It also provides relevant keywords that you may not have considered. In the console you can see all the backlinks to your site, and the ability to remove any toxic links using the Disavow tool. That doesn't necessarily mean you can have negative reviews or articles scrubbed from the web. What it does mean is that you can ask to have spammy or low-quality links that may be harmful to your overall authority and trust score removed. If you've ever wondered how crawlable your site is, Google will let you know if it's getting errors, bad URLs, or connection issues, and it offers a robots.txt fetch tool to index all your pages accordingly. You also can integrate your sitemap to ensure Google has a thorough understanding of your web pages and the prioritization of those pages. While we're on the subject of SEO tools, I highly recommend using SEMRush or MozPro to audit your SEO ranking. Those tools give amazing insight into keywords, competitors, authority, backlinks, and much more. SEMRush has its own Google Chrome extension called SEMQuake, which also gives you great SEO insights as you search and view webpages. SEO is an ever-changing process that can take time to establish great authority and trust. It's similar to dating. At first you'll have zero trust and authority but, over time, you can begin to build that relationship with search engines. Try to cheat the system and Google will severely punish you, so it's important to avoid keyword stuffing, spamming low-quality backlinks, having content that is too thin, duplicating content, or failing to offer a mobile-friendly site. Creating valuable and relevant content should be one of the primary focuses for your SEO strategy.